This year we are reading The Book of Mormon again. My daughter is in the Personal Progress Program, and, if she does everything she can, it will have her reading the Book of Mormon 3 more times in the next 5 years. In a "small but frequent" effort to help her out, our family is reading one chapter of the Book of Mormon, in the morning, M-F, 52 weeks of the year. It takes about a year, at that pace, to finish it. As we were starting this round, the phrase, "“I do make the record on plates which I have made with mine own hands," led me to ask myself some interesting questions about something that we all know about, but don't often consider. 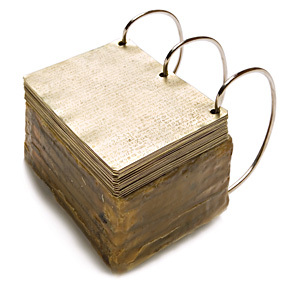 Like, how and where do you make a golden journal? Jesus - Yeaaaah. I think we should devise a personal-trainer type thing, where Nephi gets a daily workout. We will have to work on his upper body, get him seriously cut, and then have him get some real glute strength. I say we "forget" to tell him stuff so that he has to keep going back to Jerusalem and pick stuff up. About 5 times before the big hike should do it. Ideas? God - How about we have him go to "forge school" and make a heavy journal for him to tote around? Say 40-60 lbs? Scenario 2: Where is Nephi? Laman - Hey Mom, where's Nephi - its time for picking up goat poop. Sariah - Um, he's out in the forge. Laman - Doing WHAT? What the FREAK! First it was his hippy hiking with a wheelbarrow, and now he's out there diddly farting around again using up all the firewood! ALL because DAD lets him do it!! Sariah - He's... uh, making a journal. Its a father/son thing. You know how they are. Making records, compiling records, records, records, records! They've been really going through the camping gear too. I don't know what is UP with those two lately... I just hope it's a phase. Laman - THAT IS SO DUMB! Why does dad love him more than me! And I hate camping - I am NOT going anywhere with them; I don't care WHAT dad says. I'd rather, like, tie myself to a post than have to go camping with my family. Seriously mom - he's been getting out of goat poop duty for a MONTH! What the heck! How many pages does he freaking need! 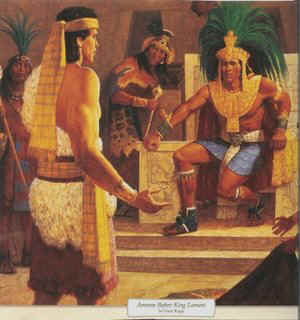 "My name is Nephi and I'm a total LAME-O" - end of story! I'll even write it for him! "I am a total nerd-dork who is wasting all my life making a freaking journal so I can get out of goat poop duty..." It's not like anyone is ever gonna read that stuff. What a dweeb. Seriously. Sariah - I know... I know... but you got to go to J.E.W. Jerusalem for a semester, and he didn't. Can you hand me my favorite golden pot - the big heavy one with the lid and handles? Laman - Sure. Where is it? Sariah - What do you mean, "where is it?" It's where it always..... NEPHIIIIIIIIII!!!!!! Scenario 3: NO, It's YOUR turn! One of my favorite explanations about the plates is from Orson Pratt’s description of rings “through which a rod might easily be passed, serving as a greater convenience for carrying them.” Those plates would have been a significant weight and now we gotta tote these suckers around. It is like an early version of the TOTAL GYM. You put a stick through some weights, and then do a bunch of repetitions. But who would have had the responsibility? Nephi's wife: Honey, if I have to tote one more kid around, I swear, I'm just gonna lose it! I was up with the baby all night, and your dad says we gotta head even FARTHER into I-don't-know-where again. I"m really starting to think this was a bad idea. Nephi: Um. I can take munchkin off your hands, if you want to take my plates?